Something that has been reduced in size, quantity, or quality: When Joe closed the windows in his house, the diminishments of the loud noises from the street construction were less irritating. 1. A gradual reduction in force or loudness; antonym of crescendo. 2. In music, a gradual reduction of force or loudness; gradually decreasing in volume; decrescendo. 3. A diminuendo passage. Symbol: >. 4. 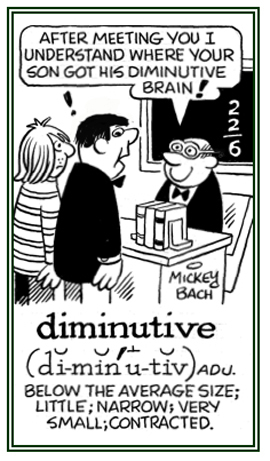 Etymology: from Italian, present participle of diminuire, "to diminish" from Latin d1minuere, "to reduce". 1. A suffix or a word which shows that something or a person is small. 2. 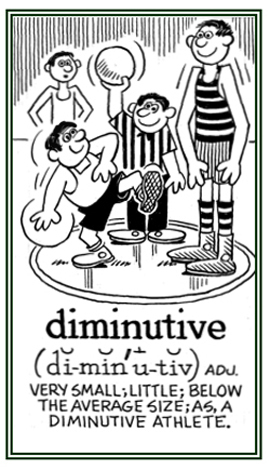 An informal identification or form of a name: "Diminutives are used to indicate a name; such as, Richie or Rich for Richard, John for Jonathan, or Gin or Ginny for Virginia." 1. A descriptive word that is formed with a suffix; such as -let, -ette, -ling, or -kin, to indicate a small size: A diminutive term or name indicates a small size, youth, familiarity, or fondness; for example, a kitchenette, a duckling, or a booklet may suggest that something is appealing or lovable in some way. 2. A reference to a person or thing that is very small or much smaller than is normal: Anything that is diminutive expresses smallness; such as, "ringlet" which is the diminutive of "ring". © ALL rights are reserved. Relating to or descriptive of something that is less than normal: Gerald spoke diminutively of his basketball friend's poor performance during yesterday's game. The state or degree of being very small or less than normal size. The innermost muscle of the three muscles found in each of the human buttocks that comes up from the outer surface of the ilium (wide flat upper part of the pelvis) and which is inserted into the greater trochanter (points at which hip and thigh muscles attach) of the femur (thigh bone, extending from the pelvis to the knee). It is the smallest and deepest gluteal muscle. Is minimum eget mortalis qui minimum eupit. That man is least in want who desires least. From Publilius Syrus, Sententiae (c.43 B.C.). To execute, or to manage oneself or other situations inefficiently or badly: In political gatherings, Mr. Ross was always afraid of maladministering himself and making inappropriate comments.